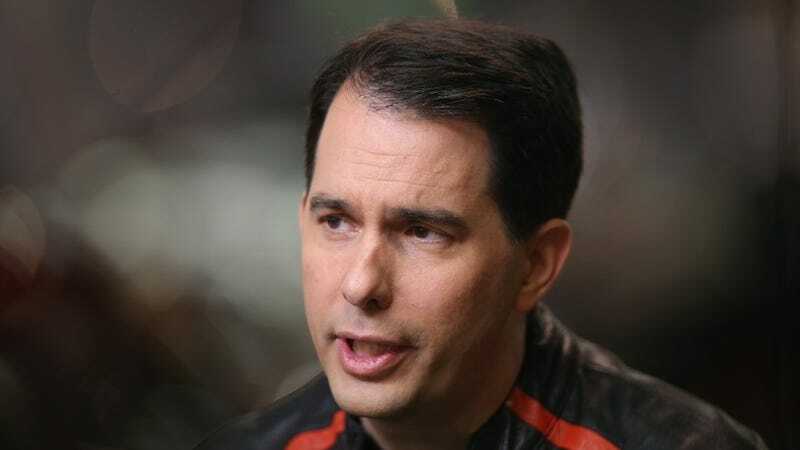 Wisconsin governor Scott Walker sacrificed a leisurely Fourth of July weekend of grill-outs and fireworks in order to sneak a variety of harmful provisions into his state’s budget. Buried in the omnibus budget bill: a law that limits the information released to the public during police shootings, as well as a dangerous rewriting of Wisconsin’s living wage law. No rest for the wicked, as they say. After months of uproar over provisions to slash hundreds of millions of dollars from state universities and strip the values of “truth” and “service” from their mission, lawmakers in Madison missed their July 1 deadline to pass the budget. In the ensuing scramble, Governor Walker and his allies in the statehouse used the 4th of July holiday weekend to insert several more controversial provisions into the massive document, which local press called “a grab bag of pet projects.” Walker and Republican lawmakers have already been forced to retreat on one of them: a gutting of the state’s open records law that would have barred reporters and the public from accessing the documents that reveal how laws are written, including drafts and e-mails between state lawmakers. Officer-involved deaths: Requires independent investigators of officer-involved deaths to delete information from reports released to the public that they believe should not be disclosed because the harm outweighs the public’s right to know. Seven-day workweek: Allows employees to specify in writing that they choose to work seven days in a row without a day of rest. Currently, factory or mercantile employees must be granted 24 hours of rest in every seven consecutive days of work. Living wage: Replaces all references in state law to a “living wage” — defined as the level of pay needed to provide “minimum comfort, decency, physical and moral well-being” — with “minimum wage.” Repeals provisions in state law allowing the state Department of Workforce Development to investigate complaints that an employee is not being paid a living wage. This is all bad, but it shouldn’t be surprising considering that Walker’s disdain towards labor has been clear since he began his political career. Long ago, Wisconsin established itself as a state with some of the strongest labor laws in the country, but sadly, that reputation—as we reported last October—has been entirely ruined since Walker took office. The governor has been particularly vindictive when it comes to the state’s minimum wage law, which requires the minimum wage to also be a living wage. Currently, Wisconsin—with a minimum wage of $7.25—does not meet the living wage requirement, a matter that Walker’s office has mostly ignored. Wisconsin workers who are members of Wisconsin Jobs Now have filed a lawsuit against the governor’s office and are currently waiting for the Circuit Court judge to rule, which makes the living wage provision of the budget bill particularly beneficial to Walker and painful to the state’s low-wage workers at this point in time. Let’s conclude with this terrible reminder: Walker will formally enter the 2016 presidential election on July 13.